Celebrating the Banner of our Nation. How our flag was sewn and great projects that honor it. In preparation for a local youth summer camp, my father agreed to help me by teaching a group of 13 year old girls the importance of our nations flag and how to handle it properly. As he hung several historic US flags around the room I was touched to see what is often referred to as the "Betsy Ross Flag" among the collection. Isn't it great to think what an impact one woman's thoughtful stitches have had our country? I had to go home and do a little more research about this empowering sewing story. Did you know that at the time Betsy Ross was approached about sewing the flag, she was a widow struggling to run her own upholstery business? During revolutionary times in colonial America it was not uncommon for upholsterers to be commissioned to make flags as there was a sudden and urgent need for them. "According to Betsy, General Washington showed her a rough design of the flag that included a six-pointed star. Betsy, a standout with the scissors, demonstrated how to cut a five-pointed star in a single snip." I love it! Her sewing skill set influenced what has become one of the most recognized symbols in the world. I thought it would be fun to put my sewing scissors to work and give her trick a try! You can too by clicking here! I love to see our nation's flag fly particularly through the summer months when the daylight is long and our city, state and national celebrations give us time to reflect on it's deepest meanings. Learn more about Betsy Ross' story here and take a few of your own stitches to honor our banner with one of our patriotic project kits! The Hexi Door Greeter for July by Buttermilk Basin finishes 9" x 32.5" and is a beautiful way to show patriotism through wool applique! This sample was made by Marianne Michaels. That tiny slice of watermelon has my mouth watering! Sew up the perfect foundation for your patriotic party table with the Patriotic Runners pattern by Coach House design. 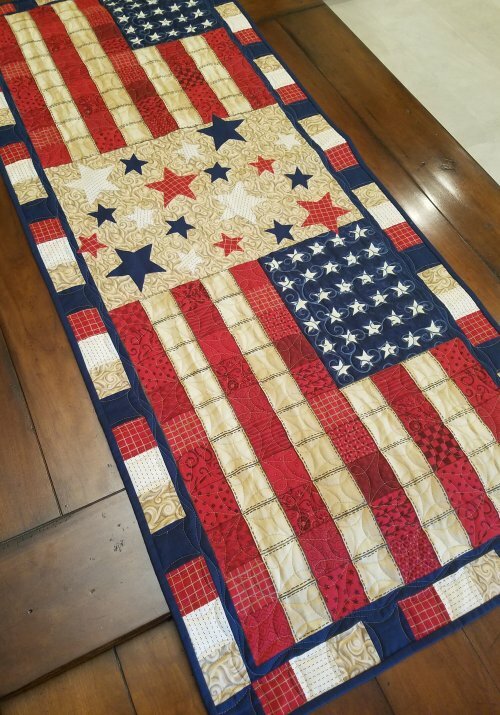 This pattern offers three different options using the their flag panel! Julie Hancock stitched this one together faster than you can say fireworks and Ramona Sorensen's machine quilting added just the right finishing touch! We have kits! If you have been considering joining our Saturday Sampler Mystery Block of the Month by Amy McClellan of Under the Garden Moon, now is the time! Sign-ups continue through June 30th. 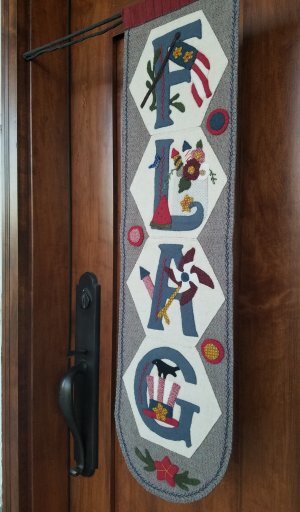 We are so excited to feature this wonderful skill-building sampler quilt designed by Amy exclusively for Corn Wagon Quilt Co. The theme is "Into the Woods" and the fabric bundle shown here represents the overall style and color scheme. Our Saturday Sampler will take place the 1st Saturday of each month for 12 months beginning August 4th. For all the details and to register click here or stop in and visit us at the shop! Recently, a young man walked through our door inquiring about our wool selection. As he selected a beautiful pile of wonderful wool we couldn't help but ask what he was making. 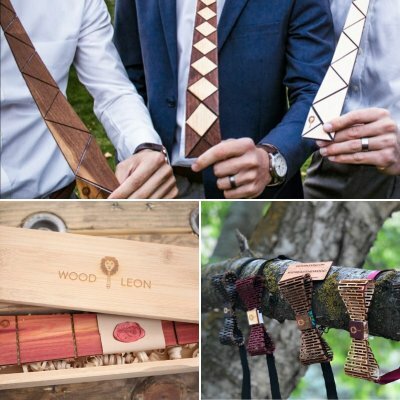 When he said, "wood ties," we were indeed intrigued! He directed us to his Instagram page and sure enough, he makes the coolest ties made from wood! Where does the wool come in? He uses it to back the wood making the the ties flexible without fraying. Spencer Hughes has become a regular here at the shop and we are excited to now have his ties on display for purchase. Come in and see them in person! Each one is a unique work of art and from what we hear, makes a great conversation piece! Even the packaging is cool! We suggest following him on Instagram @wood.leon and can't wait to see what he comes up with next! June 25th - 25% off MODA PRECUTS including all in-stock, regular price LAYER CAKES, JELLY ROLLS & CHARM SQUARES! 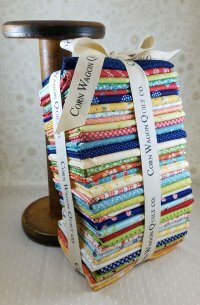 Bring in your reusable, cotton Corn Wagon Quilt Co. bag and receive 20% off any regular priced items you can "stuff" inside. Don't have a bag yet? Purchase one for $5 and reuse it every 5th Saturday for the Stuff-a-Bag Sale!